Alfonse Marcello D'Amato (born August 1, 1937) is an American lawyer and former New York politician. 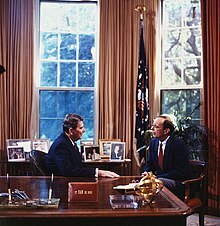 A Republican, he served as United States Senator from New York from 1981 to 1999. He subsequently founded a lobbying firm, Park Strategies. As of 2019, D'Amato is the last Republican to represent New York in the U.S. Senate. D'Amato, of Italian ancestry, was born in Brooklyn and raised on Long Island, in the small village of Island Park. He is the son of Antoinette (Ciofarri) and Armand D'Amato, an insurance broker. He is a graduate of Chaminade High School, Syracuse University, and Syracuse University College of Law. At Syracuse University, he was a brother at Alpha Chi Rho fraternity. D'Amato and second wife Katuria have one son, Alfonso Marcello D'Amato, born in 2008, and a daughter, Luciana Cioffari D'Amato, born in 2009. D'Amato has four adult children from his first marriage. Katuria D'Amato filed for divorce on 3 October 2017. Alfonse started his career in politics in Island Park. He was involved heavily in the Unity Party of Island Park, the local political party that ran village elections in the small Village of Island Park. He was then appointed the village attorney. After taking the values taught him in Island Park he then went on to the Nassau County Republican Party, and he held the appointive position of Public Administrator of Nassau County, where he was responsible for managing the assets of county residents who died without wills. He was first appointed and then elected Receiver of Taxes of Hempstead, New York. He left this office to become a town supervisor in Hempstead and in 1977 he was elected presiding supervisor. He was also vice chairman of the Nassau County Board of Supervisors from 1977 to 1980. Despite being a rather obscure candidate, he defeated incumbent Sen. Jacob Javits by 56% to 44% in the 1980 Republican primary election, after Javits' 1979 diagnosis of generally fatal amyotrophic lateral sclerosis. Javits nevertheless pursued the seat on the Liberal Party ticket, splitting the left-wing vote in ordinarily liberal New York with Democratic Congresswoman Elizabeth Holtzman and leading to D'Amato's 45% plurality victory. He was re-elected in 1986 and 1992, but lost in 1998. D'Amato drew the nickname Senator Pothole for his delivery of "constituent services", helping citizens with their individual cases. While some New Yorkers meant the nickname as a pejorative, many others saw it as a positive affirmation of his attention to getting things done. He also holds the record for the second and eighth longest filibusters ever recorded in the United States Senate. He is remembered for his unique and rather comical filibusters. In 1986, in a filibuster against a military bill that lasted 23 1/2 hours, he read the District of Columbia telephone book. In 1992, D'Amato filibustered a bill that would have caused the loss of 750 jobs in upstate New York by singing "South of the Border (Down Mexico Way)". He is also remembered for presenting a poster of a "Taxasaurus Rex", which he then stabbed with an oversized pencil. He was a member of the President's Commission on Aviation Security and Terrorism (PCAST), which was set up in September 1989 to review and report on aviation security policy in light of the bombing of Pan Am Flight 103. While he was in office, he was chair of the Senate Committee on Banking, Housing and Urban Affairs, and was a member of the Senate Finance Committee. As a member of the former, he became a leading critic of the Clinton administration regarding the Whitewater scandal, and during 1995 and 1996, he chaired the hearings-heavy Senate Special Whitewater Committee. As a member of the latter, he championed the cause of Holocaust survivors trying to recover relatives' funds from accounts in Swiss banks. 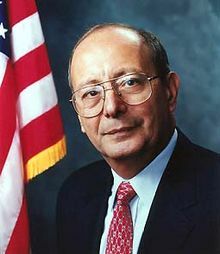 D'Amato was very influential in New York Republican politics, and he was widely considered the "boss" of the state party during his Senate years. For example, he played a leading role in recruiting George Pataki and in securing him the Republican nomination in the gubernatorial race of 1994. D'Amato was known for being fairly conservative, a reflection of then-strongly conservative Nassau County and Long Island. He strongly supported the conservative positions of his party on "law and order" issues such as capital punishment and harsh penalties for drug offenses. 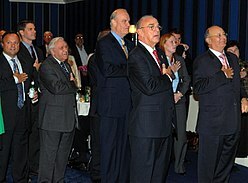 On some issues, he agreed with the opposition: in 1993, D'Amato was one of only three Republicans to vote in favor of allowing gays to serve openly in the U.S. military. In 1996, he was among the minority of Republicans to vote for the Employment Non-Discrimination Act. In 1998, the Human Rights Campaign endorsed D'Amato for re-election over socially liberal Democratic Congressman Chuck Schumer because of those votes. D'Amato, however, voted for the Defense of Marriage Act in 1996. On labor issues too, he frequently sided with Democrats. His 54% to 44% loss in 1998 was attributed to a lack of support among moderate voters in New York City, the site of opponent Schumer's US Congressional district. His loss was also partially attributed to reports arising from D'Amato's use of the term "putzhead" (a Yiddish vulgarity) to refer to Schumer. According to The New York Times, D'Amato was quite popular among his peers on Capitol Hill. Shortly before leaving office, D'Amato published his book of recollections, Power, Pasta and Politics. After retiring from politics in 1999, he became a regular columnist for George magazine until it ceased publication in 2001. He has also emerged as an analyst for Fox News. A notable on-air incident occurred when D'Amato took offense at comments of GOP strategist Jack Burkman. Saying he agreed with Berkman's suggestion that the Postal Service should be privatized; D'Amato slammed him for characterization of postal workers, that D'Amato said were offensively racist. D'Amato is chairman of the Poker Players Alliance, a nonprofit organization set up to help protect and fight for the rights of poker players in the United States. Part of their mission is to protect the right of poker players to play online. He appeared on Howard Stern's Sirius-XM radio show on July 20, 2009, to promote the Poker Players Alliance. On June 12, 2007, the former three-term Senator from New York endorsed one-time Senate colleague from Tennessee Fred Thompson for the Republican nomination for president in 2008. In explaining his endorsement of Thompson, former Senator D'Amato called Thompson "a real conservative", not a candidate who adopted conservative positions in preparation for an election. D'Amato added, "Fred Thompson is the kind of candidate our party can unify behind and support wholeheartedly." On January 22, 2008 after poor showings from Thompson, D'Amato threw his support to John McCain for the 2008 presidential election, saying "If you want to win in November, John McCain is the man." On March 14, 2012, D'Amato endorsed Mitt Romney for president, saying "I am proud to endorse Governor Romney and support his candidacy for the Republican nomination for the Presidency. It is time for Republicans across the country to embrace Governor Romney and make him our nominee. Governor Romney is a successful businessman. He understands how our economy works and has a proven record of creating jobs. We need a man with his experience to take charge and lead our economy or we'll have four more years of the most liberal, tax and spend administration we have ever seen. I urge my fellow Republicans to unite behind Governor Romney and make him our nominee." He and Peter Kalikow appeared with Romney at fundraisers in New York leading up to the election. On August 26, 2015, D'Amato endorsed Ohio Governor John Kasich, over colleagues Jeb Bush and George Pataki. While stating that the Republican party needs to move past the Bushes, he credited Pataki as a "wonderful guy", but cited Kasich's experience in balancing the budget as a congressman in the 1990s, and now in Ohio. D'Amato had a brief cameo as himself in the 1997 movie The Devil's Advocate. D'Amato also made a brief cameo appearance as himself in an episode of Spin City. ^ Rivlin, Gary; Richtel, Matt (March 5, 2007). "D'Amato Never Folds; Former Senator, a Poker Aficionado, Lobbies for Online Gambling". The New York Times. ^ "Alfonse M. D'Amato". The New York Times. Retrieved November 12, 2012. ^ Bratskeir, Anne (October 16, 2009). "D'Amato and wife welcome baby daughter". Newsday. Retrieved May 19, 2015. ^ Pillifant, Reid (January 6, 2012). "Anti-tax entrepreneur Marc Cenedella wants to run against Kirsten Gillibrand and pay for it, too". Capital New York. Retrieved May 19, 2015. ^ Perez-Pena, Richard (November 5, 1998). "The 1998 Elections: New York State – The Parties – New Order for New York's G.O.P. and Democrats". The New York Times. ^ Stanley, Alessandra (October 19, 1992). "Senator Pothole's Ultimate Race; Al D'Amato Runs as the Big Guy for All Those Little Guys". The New York Times. Retrieved October 5, 2014. ^ Fouhy, Beth (June 13, 2007). "Clinton Gets Endorsement From Spielberg – The Huffington Post". Huffington Post. Wikimedia Commons has media related to Alfonse D'Amato.